As social media has evolved, so has shopping. A physical store footprint is now expected to connect with other branded content online and create a seamless consumer experience. With the rise of social media among Millennials and Gen-Z customers, retailers are re-designing their brick-and-mortar stores to create more of an immersive brand experience. A future-proof store design looks to connect, entertain and build a stronger sense of brand love. As new shopping behaviours emerge amid the rise of social media and the fiercely competitive market, we look at how a power-house, fast-fashion brand nails the in-store experience. 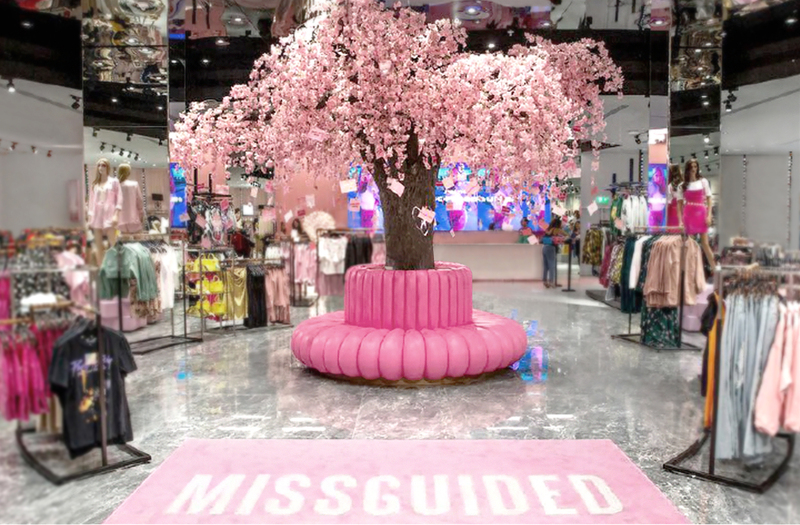 Prop Studios were approached by global fast-fashion brand, Missguided to design and produce a customer-centric store experience complete with insta-worthy moments as part of their store launch in Dubai. Millennials and Gen-Z customers were undeniably a focus and Prop Studios looked to online trends to inspire the design direction. From that, we created a series of stunning sculptural displays and installations that offered a more interactive shopping experience for the Missguided customer. Until recently, brick-and-mortar stores were designed to store and sell stock, however this has proved to no longer be adequate in the modern world of retail. The modern customer wants to be able to share each moment of their life on social media, and for that to happen retailers will have to create stores that are worthy of being posted on the photo-sharing app. Social media has become a new leader and going forward brands will be looking at incorporating this trend into the physical store experience. For a brand to remain relevant and evolve with the latest trends, they need to serve the customer’s needs. With a deep dive into customer profiling and trends analysis, Prop Studios looked to connect the Missguided customer (#Missguidedgirl) and drive their large social following in-store. Forward-thinking brands are now voicing their core values and building lookalike communities. For Missguided customer, this came in the form of promoting self-love and girl-power. 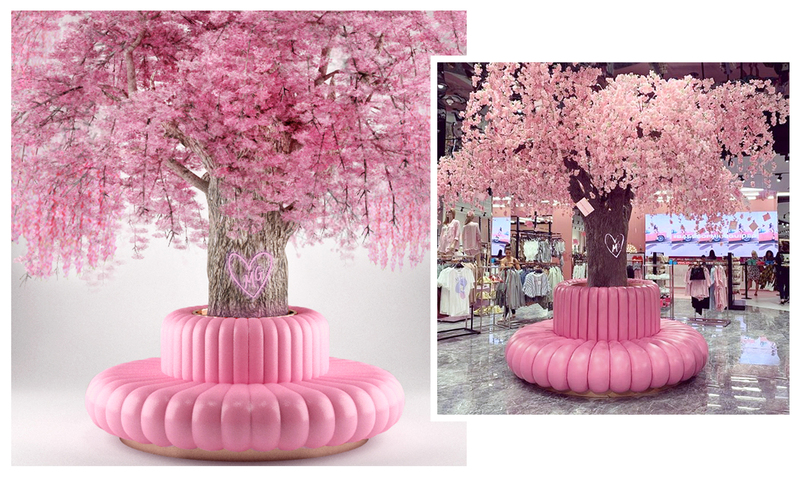 As a push for social sharing, Prop Studios designed, and 3D printed a cherry blossom tree that would take over the centre of the store, providing the perfect social media opportunity. Suspended from each branch are motivational cards, love heart sweets and emergency glitter pills – promoting self-love and positivity. The use of hot pink colours, hearts and modern linguistical slang aim to convey a ‘bad-girl’ and ‘fabulous’ feel. Oil drums used as mannequin bases and table plinths to display product were designed to reflect the Missguided perfume range. An insta-worthy installation combines a series of 5 ‘dream phones’ based on 1950s American diner phones, sprayed in millennial pink and then encrusted in pink disco ball tiles. Each phone plays a series of inspirational voice recordings that play each time you dial a number. ‘Have a seat babe’ embroidered onto a lip sofa accompanied by a large Missguided rug was designed to create another instagrammable moment within the store. The future of retail design has become more and more about the brand experience and Prop Studios has been at the forefront of store design that elicit brand interaction for the modern consumer. For a further insight into our design and production process and to find out how we can help make your brand future ready, please contact us. Alternatively, to organise an initial conversation with our brand director, please call our studio on +44 (0)207 399 8664.